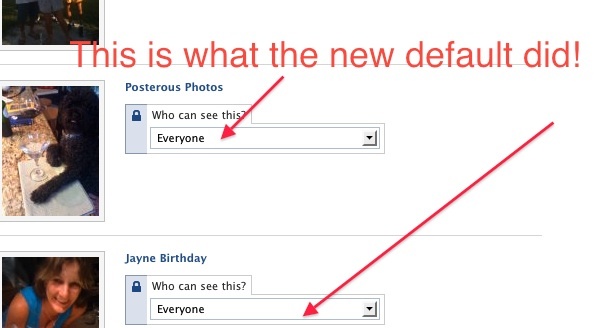 WARNING: New Facebook Privacy Settings Need Your Attention Now! Just when you thought it was safe to play in the online sandbox – bam! Facebook dumps a load of broken glass into it. This week Facebook announced that they made “changes to give you more control.” Truth is they actually made changes that give you less control over the content you share with your trusted network, unless you carefully moderate your settings now and be aware that everything you post defaults to EVERYONE! If you didn’t already know this, now you will. When you publish content or information using the “everyone” setting on Facebook, it means that everyone, including people off of Facebook, have access to that information. That content is open to everyone and will indexed by search engines and appear in the public results. You do not have control over what anyone who finds it does with it. But you’re smart, so you care about managing your reputation on the Web. Stay alert. Anyone who logged in to their account this week got a pop up message informing them to their new terms. PLEASE PAY CLOSE ATTENTION! When you click through the new terms, by default, you agree to share everything with everyone. Yes, EVERYONE. After you agree to the new terms, Facebook gives you a screen (that suggests) that allows you to retain your current settings or accept the new settings by clicking the radial dials. Although I selected to keep old settings until I could review the new terms, a couple things happened that REALLY surprised me. Each new posting to your wall requires that you select who you want to share the information with. It’s in a box on the right hand bottom side of the text box. It defaults to EVERYONE! No matter what your privacy settings are in your master settings, you now need to CHOOSE, for every status update, who you want to share it with. So, don’t forget the extra step. Why would Facebook do this? Because they want the site content to be searchable by major engines like Google and Yahoo!. Who does that benefit in this case? Well, primarily Facebook. It builds traffic and lures advertisers. Your Online Footprint. Guard it! I totally understand the value of building an online footprint via posting content and returning early in search results. It is effective exposure. In fact it is often the strategy that trumps any online participation. Content associated with your name that returns high in results essentially gives you greater exposure and it becomes your resume. And, that’s fine, but I don’t want my Facebook content indexed! If I were using Facebook only for business then maybe, but right now I use it as a private network of close friends and business colleagues that I know and trust. I do not want my vacation pictures showing up in the public time line on Google. Of course that may not be your choice, but if it is, be aware that the new Facebook settings have made ALL YOUR FORMERLY POSTED PHOTOS available to EVERYONE by default now. Yesterday when I posted a group of vacation photos, weirdly it defaulted to Everyone. I’ve never shared my photos with everyone. No, indeed. Then I noticed that all my photos were defaulted to EVERYONE! I had to go back in and manually change every album I had previously set to “Friends of Friends, Only Friends or Custom. Furthermore, I was really freaked out when I went to Custom on a few, and it showed the override default as EVERYONE Even though my old default of Friends of Friends still showed. I was steamed! I suggest that you go into Facebook right now and review ALL your settings and even your older content. 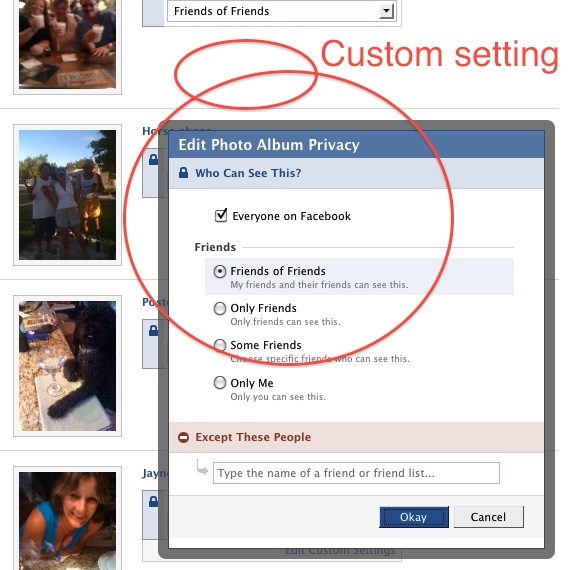 Make sure if you go into custom settings on your photo albums you un-click the Everyone if you don’t want them visible to search engines. It doesn’t unclick just because you set it to friends of friends~! Just to be safe, I went back into all my settings. I made sure to untoggle the Allow Indexing for the Public Search Results settings. I’m still digging into all of this. I will add more tips as I uncover them, but wanted to get this up right now. It’s that big of a deal to me. There’s more chatter on the Web about the new settings. Let us know here at the VMO what you find and what you think. Personally, I think this is a big mistake for Facebook – one of many they’ve made over the years. Positioning these changes as giving us more control over our content is dubious. These changes were made, in my opinion, to give Facebook more search results and increase the appeal to the advertisers they are courting. At any rate, if you don’t want the world to know what you were doing Sunday afternoon, make sure you make the appropriate selection with the share button for every post update you make. There may be a few USER benefits to the new settings, but over all, they make it harder to use – in my opinion. What’s yours? Fear of Facebook? You decide.